This unit is available for delivery ONLY and is priced for an overnight rental. This high-quality 23-Foot inflatable outdoor movie screen inflates in under a minute and has the flexibility to accommodate either front-projection or rear projection. The movie screen has a lightweight frame so that it is free-standing and allows theatre-quality movie projection. -Access to electrical outlet or generator within 100 feet of the projector and screen set-up location. -All sprinkler systems must be turned-off prior to the start of the movie and remain off until after equipment take-down. A dry lawn is preferable for the viewers on blankets. -You must obtain the necessary permits and/or permission to use parks, recreation areas, club houses, etc. 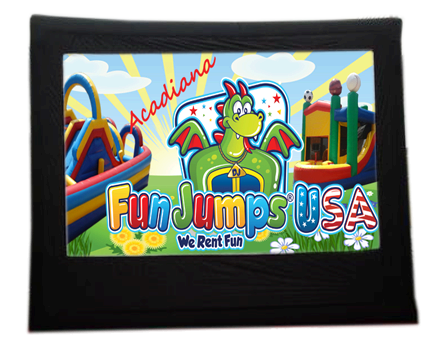 Acadiana Fun Jumps is fully insured and can list your venue as additionally insured on our policy if required. -You must select and provide the movie and adhere to any relevant licensing conditions. Typically licenses are not required for back-yard private movie showings, but they are required for any public showing. For details on obtaining licenses, go to www.swank.com or call them at 1-800-876-5577. -The professional sound system is capable of producing very loud noise levels. Depending on the location and time of the event, you may have to lower the sound level to an acceptable level. It may be a good idea to notify neighbors (or invite them over) of the event in advance.